There are endless variations of chicken salad recipes but most of them have a few things in common. Tons of mayo, hidden fat, and empty calories. Say goodbye to globs of mayo and hello to lighter chicken salad. The chicken salad is fast, easy, the whole family will enjoy it, and there’s so much flavor they’ll never notice it’s lighter. I replaced the mayo with plain fat-free Greek yogurt. 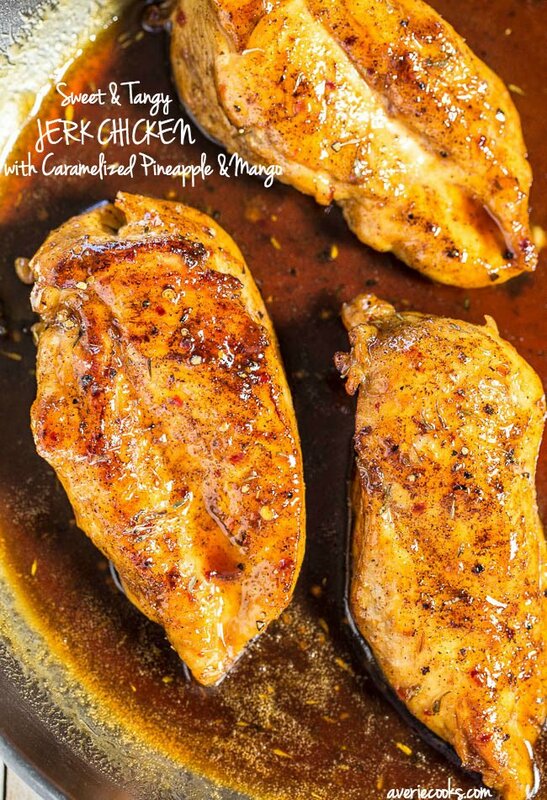 It’s creamy, coats the chicken perfectly, and adds wonderful moisture to the already plump and juicy chicken. To bump up the tang factor and to thin out the yogurt, there’s lemon juice. Green onions and garlic boost the savory flavor while celery and slivered almonds add crunchiness and texture. 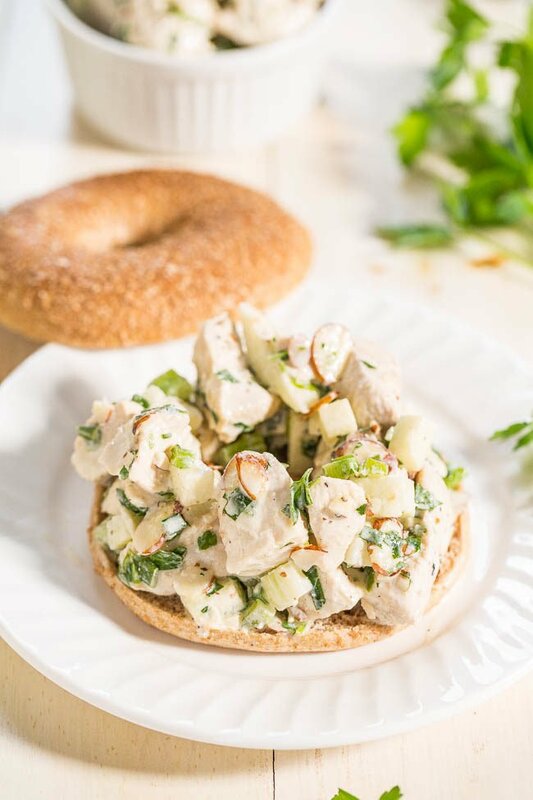 I like a hint of sweetness with my chicken salad and added green apple which increases the amount of crunchiness which I love, but it’s optional. Red or green grapes are also a fun twist. I used Thomas’ 100% Whole Wheat Bagel Thins. With only 110 calories, 5 grams of fiber, and almost no fat they’re a great choice to keep the sandwich lighter. 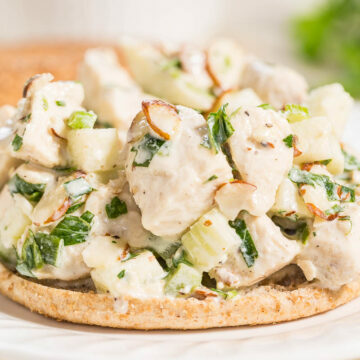 The chicken salad is perfect for healthy work or school lunches, potlucks, or easy-breezy dinners. 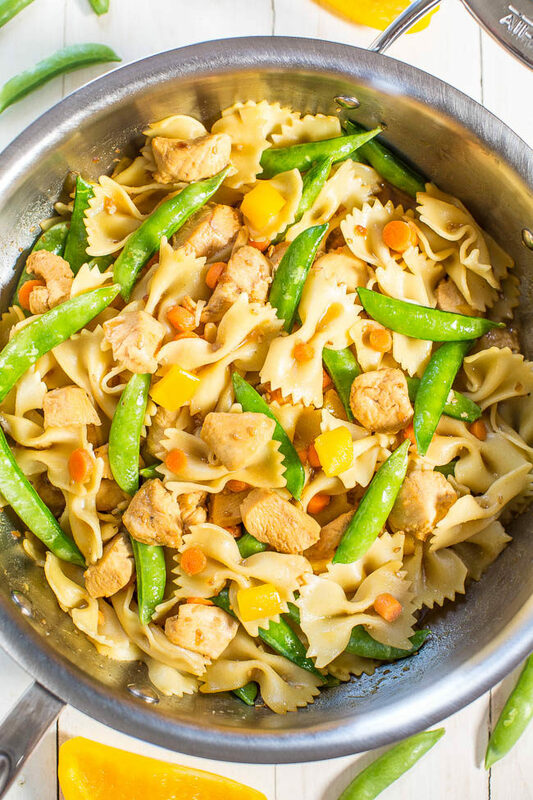 It’s a great make-ahead recipe and the flavors marry and it tastes even better the second day. 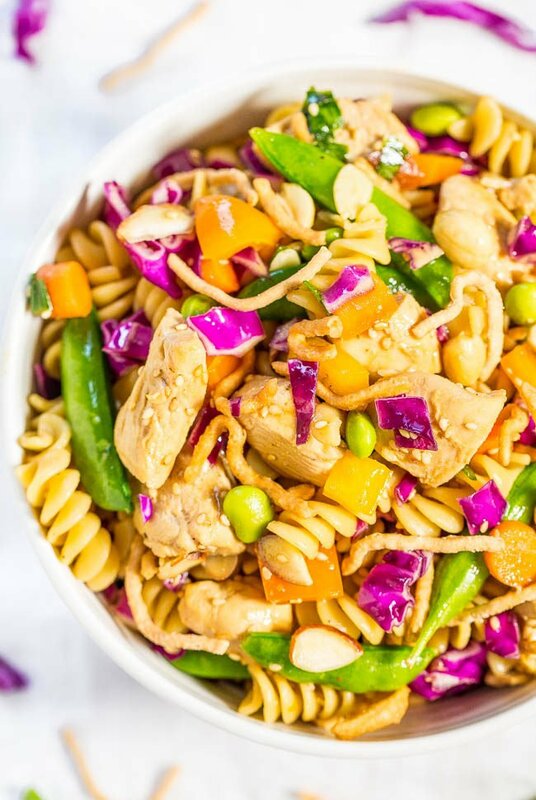 The chicken salad is fast, easy, the whole family will enjoy it, and there’s so much flavor they’ll never notice it’s lighter. Mayo is replaced with plain fat-free Greek yogurt. It’s creamy, coats the chicken perfectly, and adds wonderful moisture. To bump up the tang factor and to thin out the yogurt, there’s lemon juice. Green onions and garlic boost the savory flavor while celery and slivered almonds add crunchiness and texture. I like a hint of sweetness with my chicken salad and added green apple which increases the crunchiness, but it’s optional or try red or green grapes. The chicken salad is perfect for healthy work or school lunches, potlucks, or easy-breezy dinners. 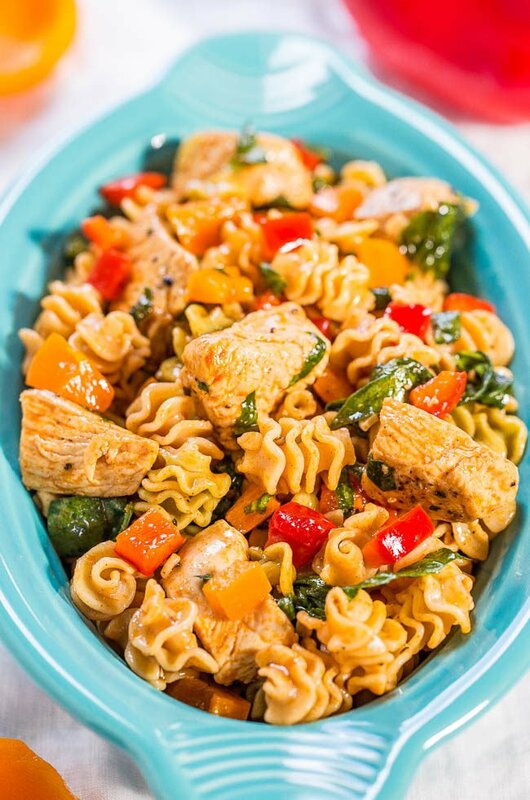 It’s a great make-ahead recipe and the flavors marry and it tastes even better the second day. 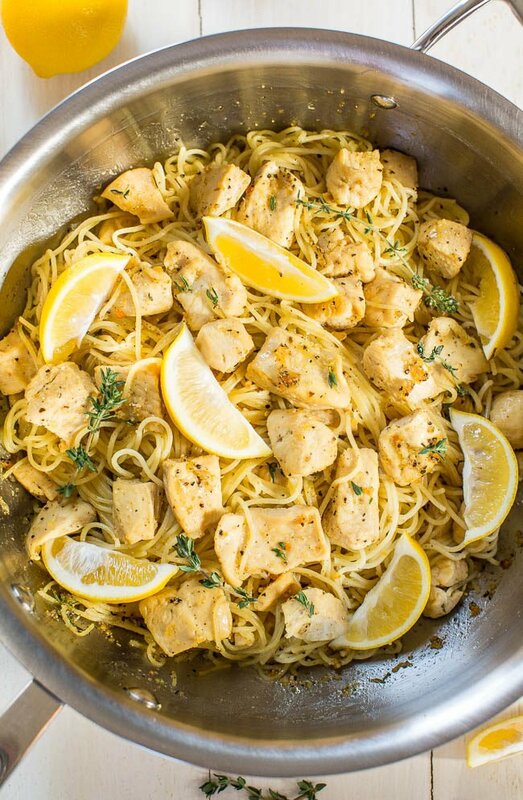 To a large skillet, add olive oil, chicken, evenly sprinkle with 1/2 teaspoon salt and 1/2 teaspoon pepper, and cook over medium-high heat for about 5 minutes, flipping intermittently so all sides cook evenly. Cooking time will vary based on thickness of chicken breasts and sizes of pieces. Allow to rest in pan while you dice and prepare the remaining ingredients. To a large bowl, add the yogurt, celery, green onions, optional apple, almonds, parsley, lemon juice, garlic powder, dry mustard, 1/2 teaspoon salt, 1/2 teaspoon pepper, and stir well to combine. Add the chicken (optionally add the small amount of cooking juices in the pan, noting it adds flavor but thins out the yogurt mixture) and stir to combine. Taste, season with salt and pepper if desired, and stir. Dish can be served warm immediately, but I prefer it as cold chicken salad. Cover, chill for at least 3 hours, or until sufficiently chilled. The yogurt coating mixture firms up as the salad chills and the chicken absorbs it. 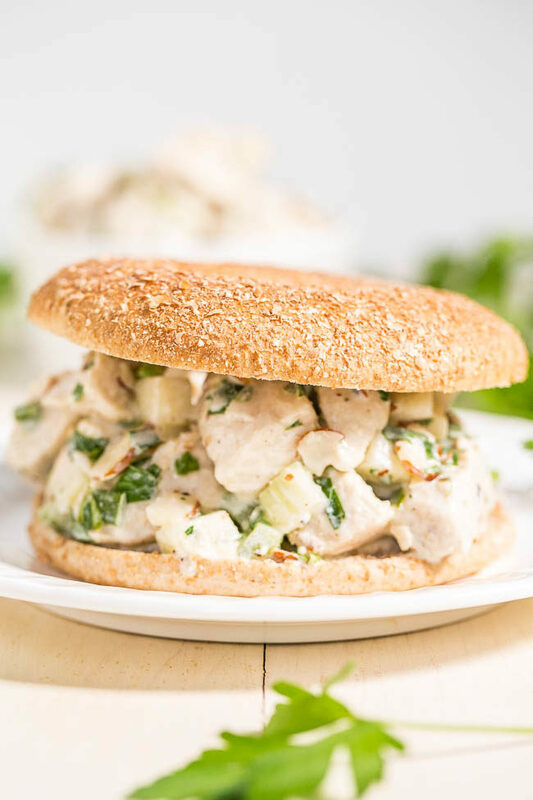 When ready to serve, divide chicken salad evenly onto toasted bagels, and serve. Chicken salad will keep airtight in the fridge for up to 3 days and I find it tastes better the day after making it because the flavors marry. I’ve been eyeballing these bagel thins at the store and wonderin’ what they’re all about, and then you posted this awesome recipe. Looks like I’ll be making a pit stop this morning so that this chicken salad goodness can make it’s way to my lunch! Pinned! Thanks for pinning and if you end up trying this, LMK! I love chicken salad with apple and celery. I’ll be trying your version soon–the lemon juice, parsley and green onion sound great in it too!! All the layers of crunch and flavors were so good! We had this for lunch and loved it as always! I haven’t made chicken salad in a while and this is a wonderful dressed up recipe. 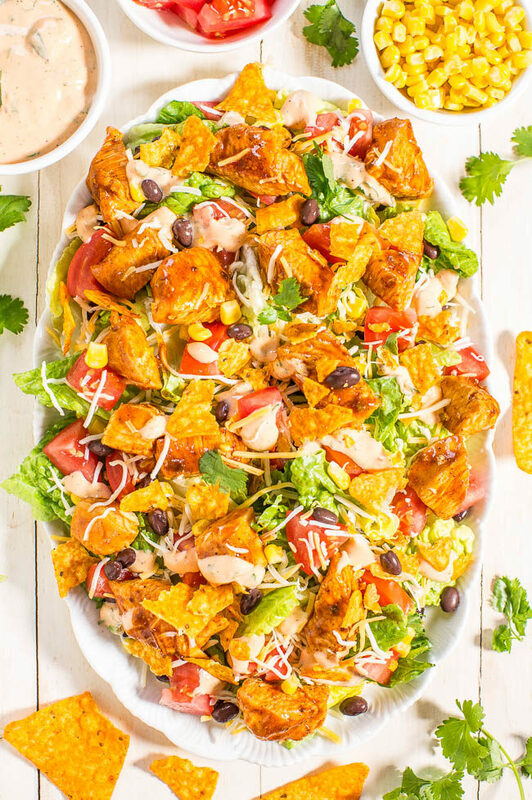 Lots going on with the mix of flavors and so much crunch. Also, I repeated the grilled salmon salad for Jon–thumbs up!! What a great idea with the Bagel Thins. i adore using Greek yogurt to make chicken salad. So much healthier! This looks amazing Averie! I love chicken salad, but not the calorie load that comes with it. Great idea! Yum! I’ll be adding fruit to mine, for sure. This chicken salad looks great Averie! Love the photos too! I literally woke up this morning and said, “I want chicken salad for dinner”. now we have the perfect recipe to use! Serendipity! Love it when that happens! If you try this, LMK! I am definitely not against mayo, I actually love it and used to eat it on toast, maybe I am weird lol. 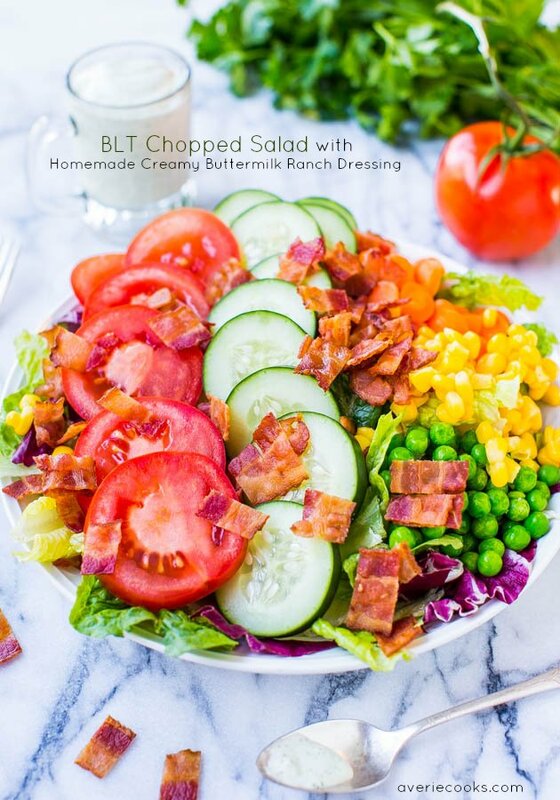 But I always appreciate lighter version, and tend to have mayo here and there on special occasions, this salad sounds so good, all the flavor and texture is there, with fewer calories, and probably a very refreshing taste. Love it! That crunch factor is where it’s at, right! Nonfat greek yogurt is pure magic! All the creaminess without the calories. 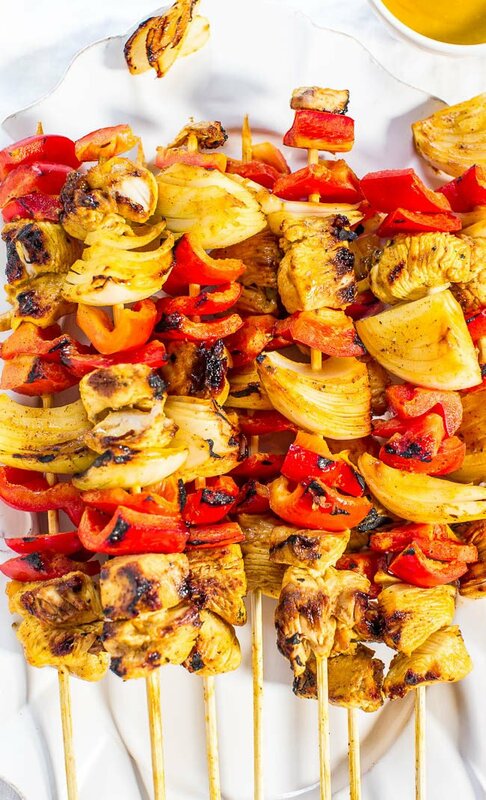 This looks super flavorful! What a great chicken salad recipe. I love the yogurt instead of the mayo because yogurt tends to be smoother and not so gloppy. I love it with apples, nuts and sometimes craisins…but I love dried fruit and tend to put it in everything. Can’t wait to give this a go. Totally agree that yogurt is smoother. If you try it, LMK! Averie this looks amazing. I am loving the idea of using greek yogurt! Healthy & delish!! My husband takes chicken salad and tuna salad a lot to lunch, I’ll have to make this for him to give him something a little different. This looks amazing! Makes me want to put together a picnic basket and cooler, and eat these on the beach! Summertime makes me want to go the beach like…everyday :) Thanks for all the tweets, too! I appreciate them! I always use Greek yogurt in my chicken salad. It’s just so fresh and healthy! What an amazing recipe you have here though. Makes me want to picnic. And the photos are just gorgeous, as always! Thanks for the compliments on my photos! this is such a delicious looking meal! and so healthy too! I love making chicken salad with Greek yogurt! Well, actually I love making everything with Greek yogurt! It adds such a nice creaminess with like none of the fat! It’s a great swap out! creaminess with like none of the fat! <--- Amen to that, right! 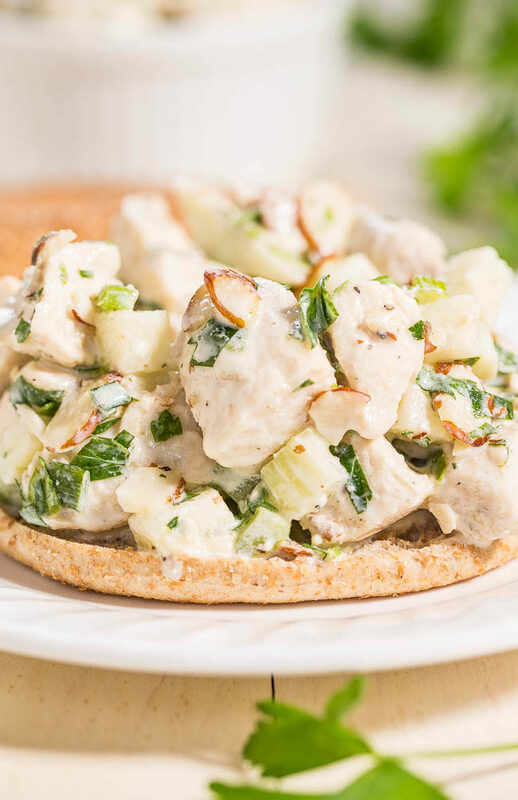 I have been reluctant to change up my usual sour cream/mayo chicken salad in favor of lighter Greek yogurt, but your delicious looking photos convinced me! So glad, it really was wonderful. The parsley and seasonings were right on. Thanks Averie! Thanks for trying the recipe and I’m glad it came out great for you! And I’m glad that it was a hit with your family and that you’re a Greek yogurt believer and glad you thought the seasonings were right on!